Brief update on my foot – it still hurts but it’s a lot better. I’m really hoping this is just a phantom pain before my half marathon next weekend. This totally happened to me last fall with some random quad pain the week before so I’m banking on it being that. Fingers crossed. I decided not to run this week but test out my foot this weekend for my last long run of 19k. The plan is to run whatever distance I can without any pain in my foot. If I have any pain, I will stop and call someone to come pick me up. Since I missed my 5k, 8k and 5k this week I tried to get a few workouts in. Tuesday was spent at the emerg. hanging out with no one, Wednesday I did some strength training exercises and my arms were wobbly and last night I went for a bike ride. Oh, and I’ve gone back to doing the 30 day plank challenge! Again, I got a babysitter since my husband is away working right now. I left the house around 7:30 and managed 11.74km in 41 minutes on the trail. I couldn’t quite see see my Garmin at the end of my ride and thought I was at 11:40 or I would have road around until I hit 12k. Keep your mouth closed as much as possible when riding your bike at night. BUGS all over my face and body. I *may* have consumed a few. Riding on a trail while it’s getting dark out isn’t something I’m comfortable with. I kept wondering if someone was going to jump out at me on the trail. I totally rode faster on the way back then I did on the way out! It was a nice little ride and my quads are going to thank me tomorrow….or are they? I mentioned boogers in the title of this post….I have nothing to say about boogers but thought it made for a better title than “bike and bugs”. However, my youngest called burgers “boogers” for a long time as she just couldn’t pronounce it properly. Oh the things kids say when they are learning words! 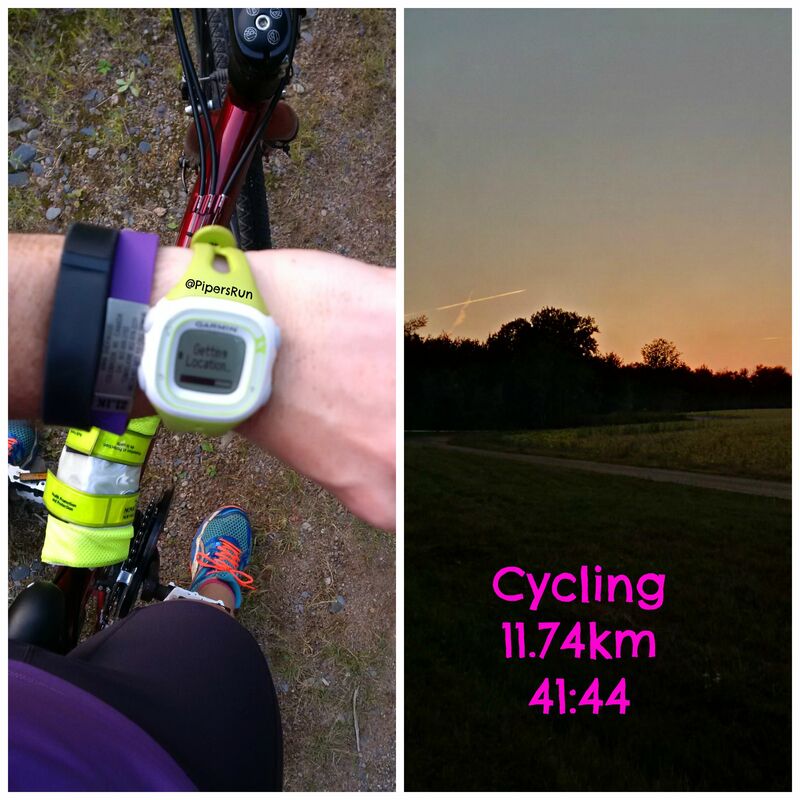 Do you ride/run on trails at night when it’s getting darker outside? What is the secret for not getting bugs all over you at night when moving at a fast pace? ← Started September Off with a BANG! Hi! In not a couch or anything, but based on my (good) previous races I wouldn’t recommend to run 19km the weekend before your half marathon. If you’ve been feeling a sort of pain, just give yourself some rest. The Sunday previous to my last full marathon I only did 10km and it went off great. By now all the important training should be done. Good luck! Thanks. I’m not going to run 19k if my foots not up for it but I do plan on getting in a few kilometres. I haven’t run all week so we’ll see what happens tomorrow. Oh my gosh, the other night I made my return to coaching and during a 6 mile run we were struck by some sort of bug hatching. I have never experienced anything like it. Everyone was coughing and hacking. You have my sympathies. So gross! Love the plank challenge. I have started doing them again and can’t believe how quickly they work and how much they work wonders on your running. Have a great weekend! (just seeing this comment now, sorry). That must have been a terrible run…bugs in the face are the worst! Glad your foot is doing ok! I love when kids mispronounce things–my sister called hamburgers “hangabers” for the first several years of her life. Adorable! I have eaten SO MANY BUGS while out on my bike. I ride on this one trail and it wasn’t even evening time yet and I was covered in dead bugs at the end of my ride. So disgusting! I have taken the last three days off also missing a couple runs but am hoping to get out tonight for a 10k and bike tomorrow. Good luck with your long run. Ewww, I hadn’t considered the bug problem on a bike before. Maybe I don’t want to ride outside. 😃. I hope your run goes well!